About 40.9 light years away there is a most interesting double star system. It lies in the constellation of Cancer the Crab. 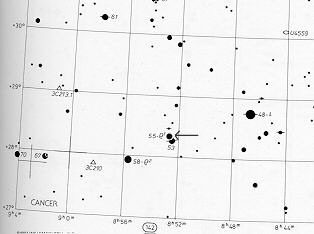 Diagram on the left above shows the star map position of 55 Cancri in the sky in the constellation of cancer. Cancri is a double star system but 55 Cancri A, the larger of the two stars is 0.95 times the mass of the Sun and 1.1 times its diameter. The smaller star Cancri B is a red dwarf of only about 0.13 solar masses. It is separated from the larger Sun-like star by 1,100 astronomical units that which means that its garvitational effect is even lower than Jupiter's effect on the Sun. Unlike Epsilon Eridani, Cancri A is not a young star but 'middle aged' like our Sun. It is about 5 billion years old, which compares to our own Sun which is 4.6 billion. This means that the larger star can almost be regarded as a single star similar to the Sun with the possibility of the possession of a life bearing planet similar to the Earth. It is about twice as rich as the Sun in 'metals' - this needs some explaining. In astronomy the term metals has a different meaning than it does in chemistry. It means all elements except hydrogen and helium. Stars vary in the percentage of metals they contain. Astronomers talk about the 'metallicity ' of a star. If the metallicity of the Sun is taken as 100, Cancri A is between 186-204. The proto-planetary disc from which any planets may have been formed would have contained a lot more silicate dust than our Sun's disc and would have a larger content of material that may have led to the formation of rocky planets. Cancri A is known to possess 5 planets one of which is only 18 times as massive as the Earth. 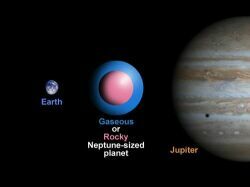 (Neptune size) as shown in the diagram on the right above (Courtesy of NASA/JPL). Because of their close proximity to the star the two gas giants and the Neptune-sized planet would all be very hot. Another Gas Giant orbits the star at a distance similar to Jupiter from the Sun. The latest planet to be detected is of particular interest. It is called 55 Cancri f and orbits the star at a distance of 117 million kilometres, about 8% farther than Venus is from our Sun, putting it in the right zone for liquid water to exist (the habitable zone). Naturally, the planet itself is unlikely to be the abode of life since because its mass is between that of Neptune and Saturn (or 45 times that of Earth), suggesting it has a gas-rich composition that is unfavourable for life as we know it. However, there is still a chance for life-friendly conditions on any moons that might exist around the planet. The gas-giant planets in our Solar System all have large moons. If there is a moon orbiting this new, massive planet, it might have pools of liquid water on a rocky surface. Such a moon would need to be at least as massive as Mars in order to have enough gravity to hang onto its water over the long term - none of the moons in our Solar System are that massive not even Ganymede or Titan. Titan does have an atmosphere but is extremely cold and could not hold onto such an atmosphere at the temperatures we experience on Earth. Many astronomers believe another planet orbits 55 Cancri A, lurking between the fourth and fifth most distant worlds, which may also lie within the habitable zone. As well as the possibility of a large moon of the newly discovered gas giant planet, planetary scientist Jonathan Lunine of the University of Arizona in Tucson notes that there is a large 'gap' – apparently devoid of planets – between the newly discovered planet and the much more distant one in that system. "Is there perhaps a much smaller, terrestrial-sized planet lurking in that gap – one that might be habitable?" he wonders. Future calculations may indicate whether any stable orbits can exist in the gap, he says, or whether the giant planets on either side of it would keep it clear of potentially habitable planets. The diagram on the left above illustrates 55 Cancri A system compared to our Solar System (Courtesy of NASA/JPL). Note that the outermost gas giant is about the same distance from the star as Jupiter is from the Sun. It's estimated mass is about 4 times the mass of Jupiter and its mean distance from the star is estimated at 5.77 Aus. Most interestingly the habitable zone is between 0.7 -1.4 astronomical units. A planet similar to the Earth could give rise to life somewhere between these distances.